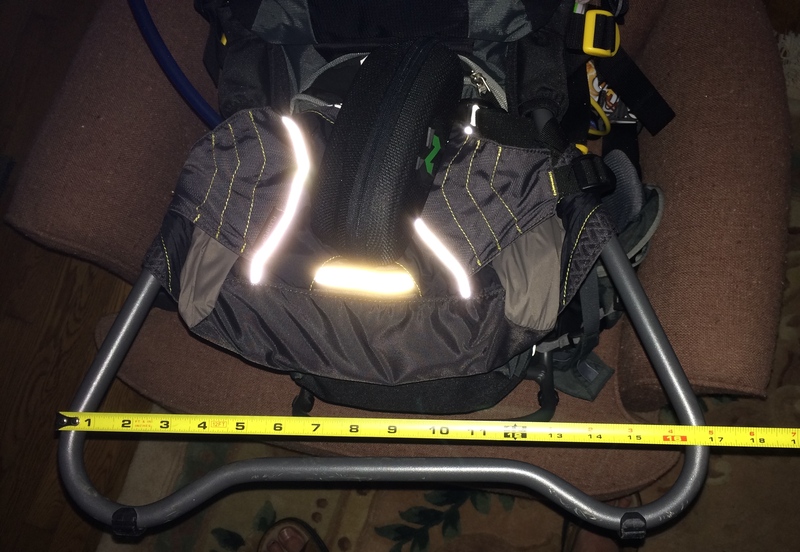 As mentioned, a few blogs ago, M and I received an ‘upgrade’ on our backpack/kid carrier. 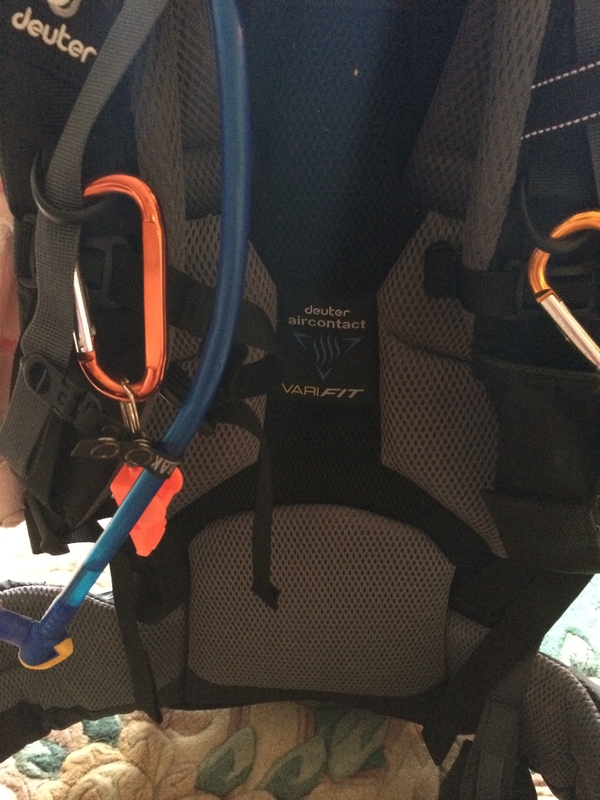 We were using the Deuter Kid Comfort II, which you can read about it in a post I wrote, here. That post goes into some important items to think about, I will re-address some of them during this post, because they are worth repeating a few times. 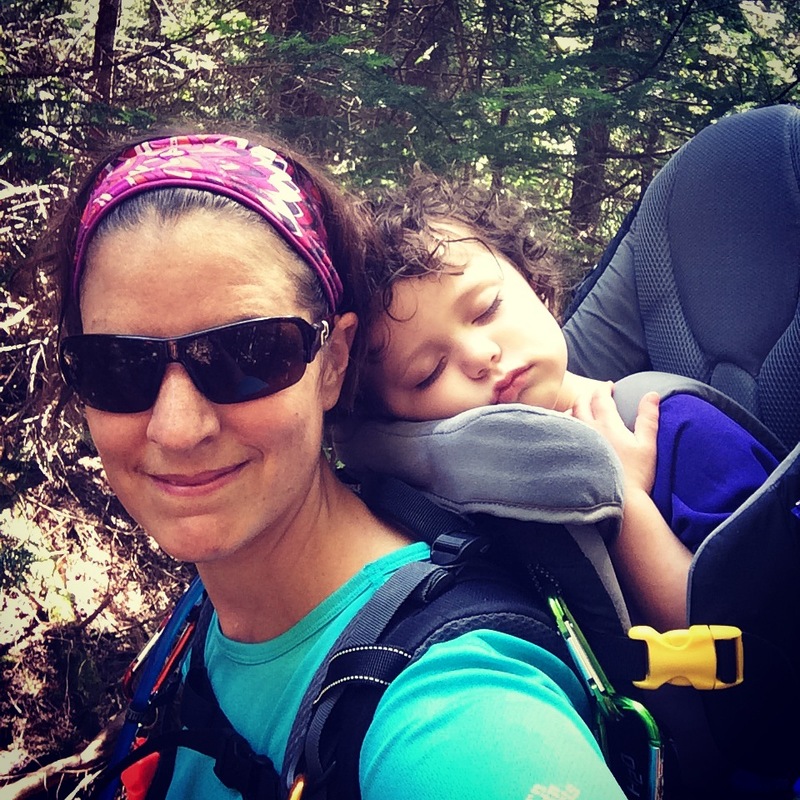 First off, my suggestion to anyone trying to find a toddler backpack for hiking is to go to your local hiking/outdoor retail store and try every single one on with your toddler in the seat. Some store examples are Eastern Mountain Sports (EMS), REI, Gander Mnt, etc. I suggest calling ahead to make sure they have kid carriers at their location. Also, make sure you have receive help from the store’s staff, they will know about the how to properly adjust the carrier for your toddler and fit the pack on you. What works for me, may not work for you. After trying several types on with M, again this year, we went with the Deuter Kid Comfort III. I have read some poor reviews over the pack. 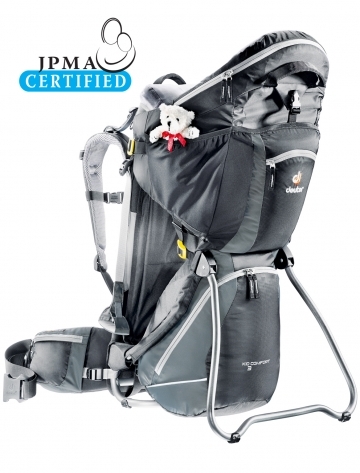 Most of the reviews, deal with not having the pack properly fitted for your child and/or you. Lastly, I suggest thinking about what you will be hiking, how long and where. This will help you find the correct carrier and also help the store’s staff give you options. I have absolutely no complaints with our Kid Comfort III (KC3). I have tried to find errors and things, I would want replaced or changed, but I can’t find have anything to complain about. For what we want, this pack is perfect. 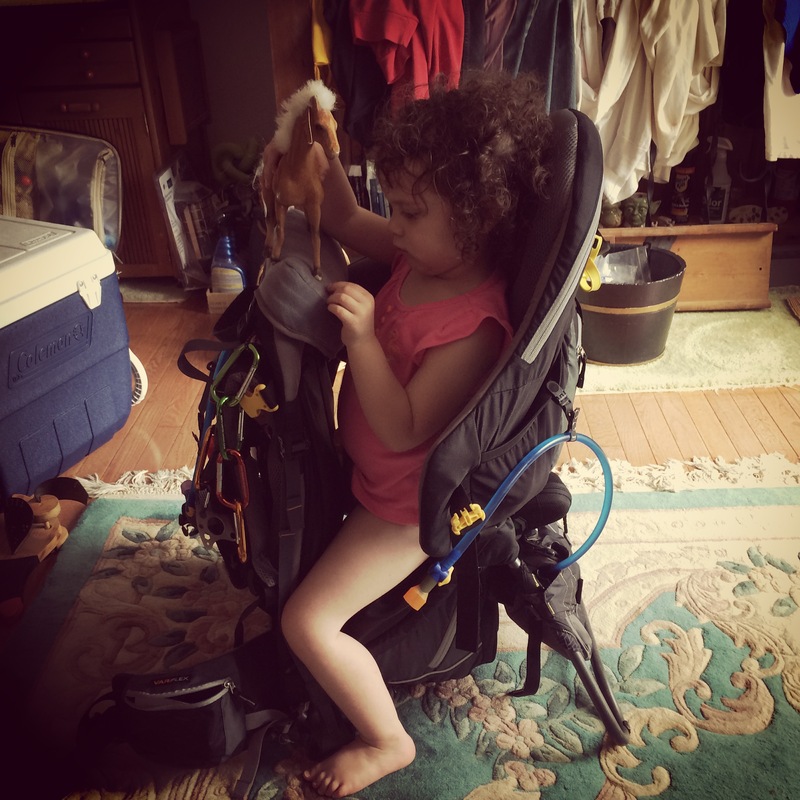 Every small issue, we had with the Kid Comfort II (KC2) has been improved. I am picky, very picky about things I purchase. With this pack, I have no buyer’s remorse…. none at all and that is definitely saying something. Here is the link to Deuter’s site to show the pack — link. You can get all the information from them, but I am going to take you through the changes and why we love this carrier. I am borrowing Deuter’s image of the Kid Comfort III. My pack is loaded out for hiking and I don’t want to get you confused on what is part of the pack and what is not. And yes, you get the teddy bear shown, red bow and all. 1) The adjustment for fitting your back, sizing your torso. Here is the old, from the KC2. The 4 loop adjustment…. A.K.A — A big PIA, if you have to change the pack between people and one is shorter or taller. With the new, Kid Comfort III the adjustment is now found under the back padding and is a simple pull to shorten or loosen to lengthen. In addition, there is an easy sizing chart on the pack itself. When looking at the back of the pack, it is located behind the right side strap where your shoulder area would be if the pack was on your back. You can also find the location for your water bladder by finding the H2O marker on the pack and you will see the sizing chart. The sizing is done by L, M,S and on the arm strap is a line to help you line up to the correct fitting. 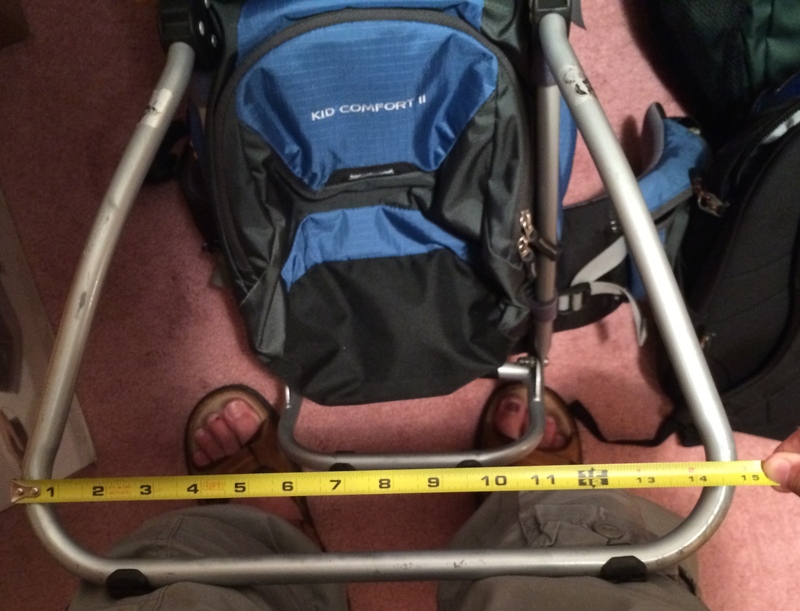 Depending on your load, elevation gain or loss, and as your child grows you may need to adjust it. So, don’t get stuck on a setting. 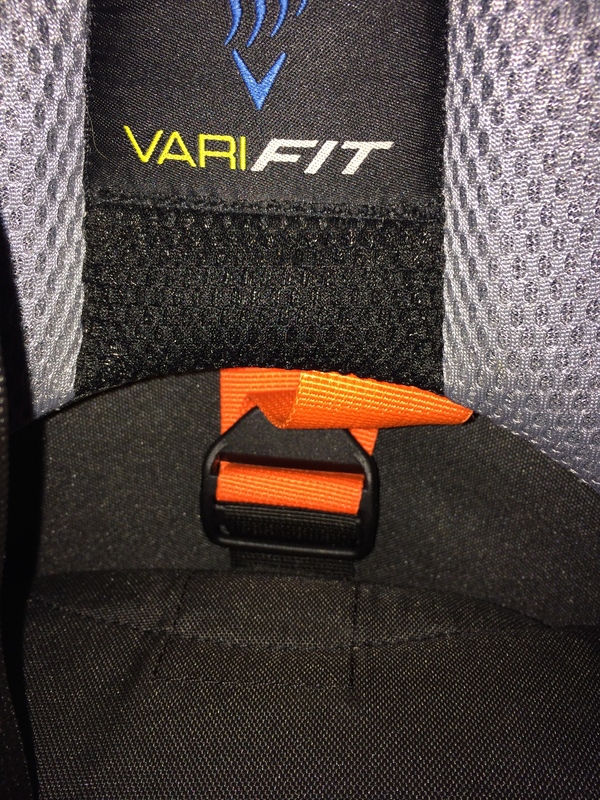 Right below the “VariFit” is the location of the strap. You flip out the padding and find the orange strap that you will loosen or tighten. 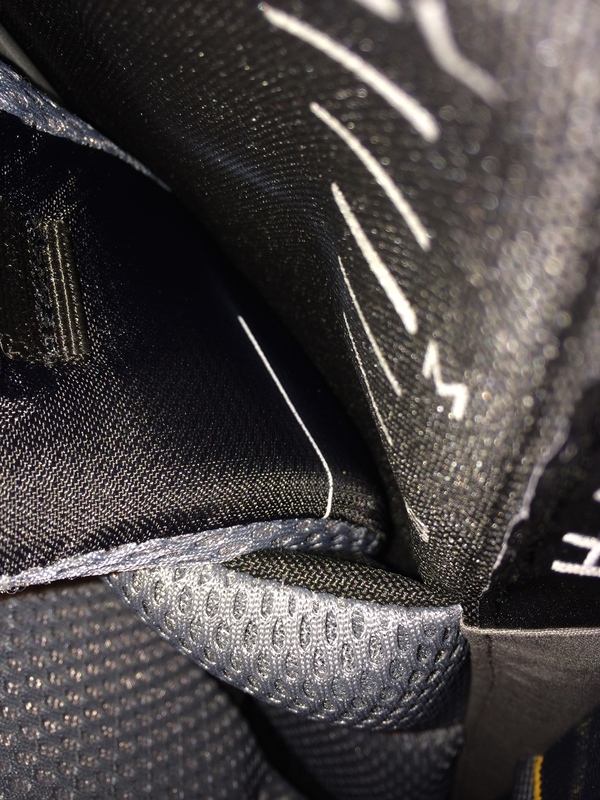 The padding is connected to the pack with velcro. Here is the sizing marker. 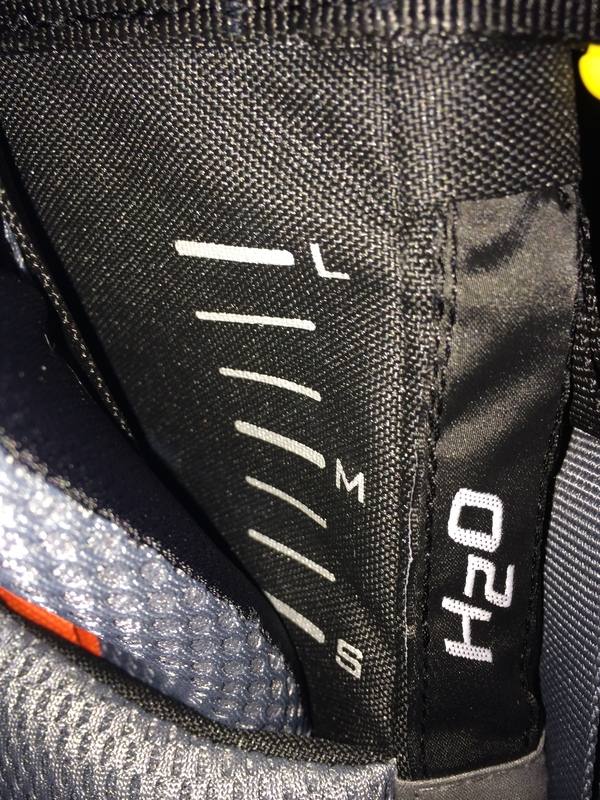 As you can see the shoulder strap has the marker (white line on the left) and the sizing chart is on the right. Another view of the sizing. As you can see, it is located near your water bladder. Next up, the kick stand. The Kid Comfort II (KC2) is more square and does not have as wide of a base as the Kid Comfort III (KC3). This is important just for stabilizing the pack on the ground. With our Kid Comfort II, we always had to help stabilize the pack for M to get in. Now, with the Kid Comfort III, M can easily get in and out without trouble. The images below show you the distance between the KC2 and KC3. The KC3 is about 2 inches wider. The front pocket of the KC3, which is located underneath your child’s seat is larger than the KC2. This is helpful in many ways, but mostly for weather changes preparedness and/or longer hikes. Do note this does depend on how well you pack. KC2 had only one pocket on your waist bucket. With the new KC3, there is one on each side and you get a mirror in one pocket. We still use our own. Simply because I can connect the mirror to my carabiner clips for easy access or quick ‘put-away’. It is a nice function to have. You can pack snacks, iPhone, mirror and other items you want on hand into these two waist pockets. The Sun Shade on the KC2 was detachable. This I hated!! We ended up either packing with J’s gear or placing it on the carrier even when we were not using it. Below is the picture to help you understand the old way. 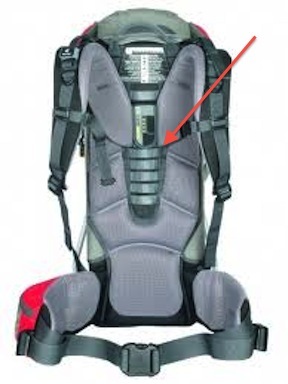 In the KC3, it is part of the carrier, it is located in a zip pocket right behind the child. Unzip the location and pull it out then when you are done with it tuck it way. No swing strings, no child trying to pull it. The KC3 comes with foot stirrups for your child, the KC2 did not. This is wonderful! Your child will have their feet secured and stable. This makes them feel more comfortable. No more swing feet, no more getting kicked. I have received many comments on this one key thing on the Kid Comfort III. It’s purely a blessing! 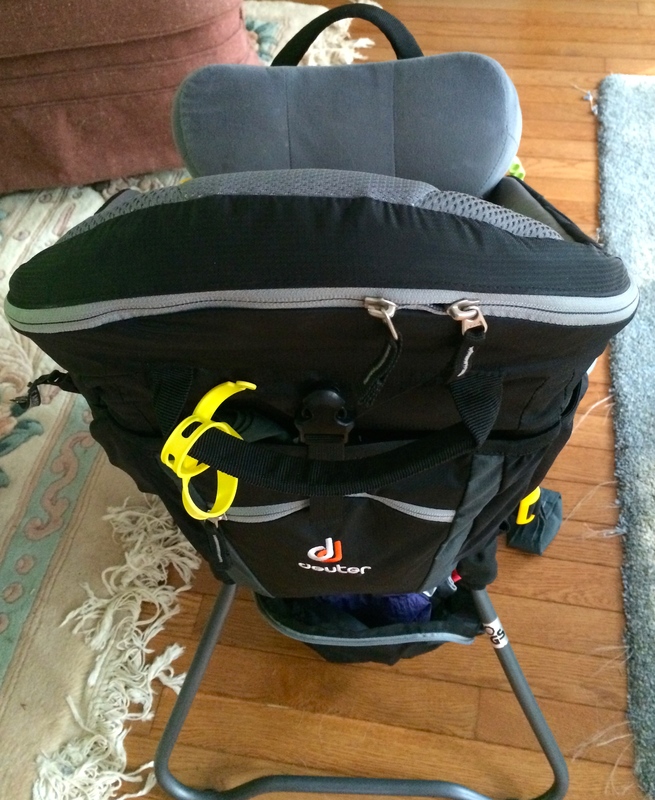 The KC3 allows you to adjust the child resistant straps at the shoulder. As your child grows you can move up the straps. In addition, you can lower the seat of your child for growth or comfort. There are two locations to do this. First, is on the side of the seat and the other is in the front of the child’s seat. The adjustments are very simple, normal loop system. The upgraded chin-pad, you can see it here at this, link. This pad can be is easily removed for washing. There are two snap buttons in the front and two loops to connect it to the pack in the back. We love this upgrade. It has helped keep our daughter’s head more stable when she sleeps. The below image shows you the sun shade, foot stirrups, chin pad. Please, note, the sun shade is not in place, this was during our lunch break and M fell asleep. We did not want to wake her. One major point, I give to the Deuter Kid Comfort is the side buckle, which allows for side entry. It is a small, but important item that all Deuter Kid Comforts offer. 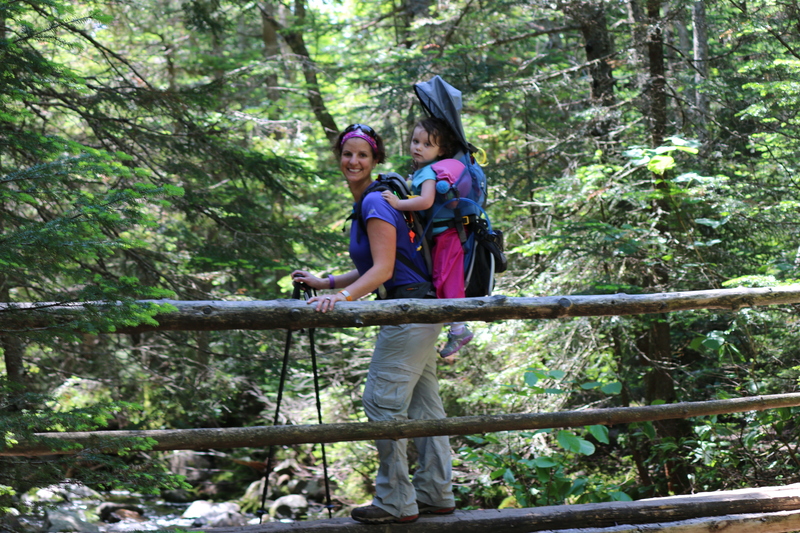 Our daughter loves hiking with us, this side buckle allows her to climb in when we are ready to go and out when its time to walk around. Yes, there are times we have to ‘put her in’, but that is only about 5% of the time, the rest she goes willing. Other carries, do not have this option. This buckle is not easily opened by a toddler. It locks in similar to a seatbelt clip. Miss M has been known to climb in the pack when I am cleaning it or packing for a hike. As we did with the Kid Comfort II, we connected a camel back waist pack to the back, so M has her own water source. This does add the weight to the pack, so be wary when doing this. 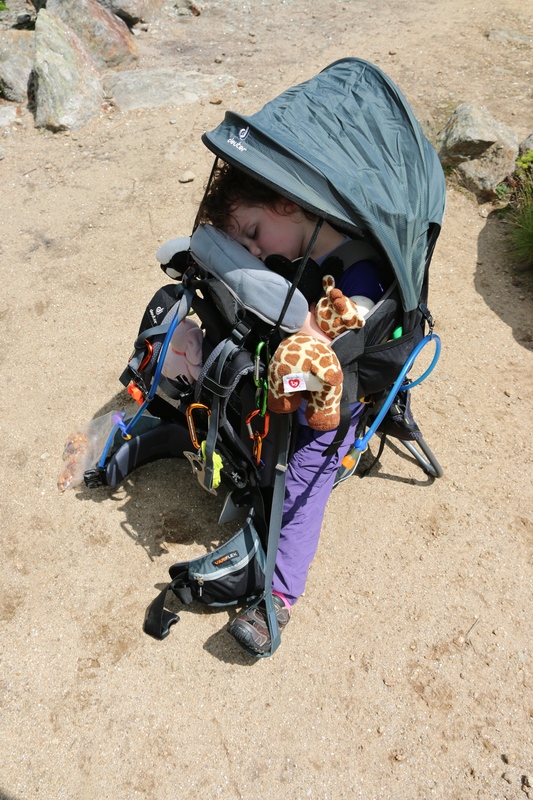 This is the only issue I have will ALL child carriers used for hiking. There is no location for your child to have their own water source. Yes, most packs have a 2 Liter area for a bladder. But this means you and your child will need to spilt it. Two liters of water can go quick on a hot, humid, or harder trail. In addition, we place Nuun in our water for electrolyte replenishment. Since, M isn’t doing much work, she doesn’t need them. Nuun is another recommended item for hydration. Unlike, Powerade, Gatorade, and other sugar filled hydration fluids, Nuun uses no sugar, no carbs it’s a great hydration source. Oh, as a suggestion, don’t use the Strawberry lemonade, it’s the only type so far we do not like. And my husband loves Strawberry lemonade. If you have any questions or areas you would like clarification on. Please, don’t hesitate to reach out to me.